A .eml file viewer will let you open email files created by applications like Winmail and Outlook Express. 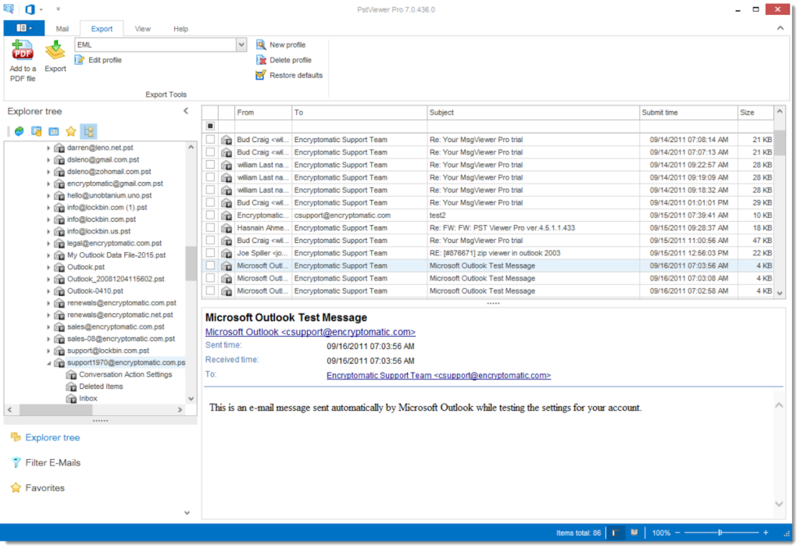 But what if you need to open other types of email files, such as Outlook .pst or .ost files or .msg files? Will you need to install three more software packages to be able to access the email stored within those files? Now there is an email viewer available that allows able to manage multiple email formats while providing a single view across all of your different email content formats. EML Viewer Pro by Encryptomatic LLC is an advanced email viewer. It is in use in many enterprise environments, and is available as a .msi installer package. It is also easy enough to use that it can be used by small business and home users to manage their email. EML Viewer Pro is also capable of reading not only .eml formatted email messages, but also Outlook .pst and .ost files and .msg files. EML Viewer can display emails that are formatted as html, text or rich text files. It can also convert all of these types of email formats into PDF files, including the file attachments. All emails are not created equally. In fact, some are quite complex files. They can include html rich text, file attachments, and embedded pictures. One of the areas where email viewers often fall short is in dealing with OLE embedded objects within the email. Writing software code to handle these situations is very difficult and prone to errors, and as a result these objects are often not shown correctly, are inaccessible, and omitted during the rendering of the email. PstViewer Pro excels at rendering these difficult emails, the product of years of experience and testing across millions of email. Click here to download a 15 day free free trial of EML Viewer Pro. Next PostNext A Simple .EML Viewer.